Celebrity endorsed headphones usually are the product of tenuous marriages of form and function – as tenuous as the celebrities’ marriages themselves. The form is typically the dominant part of this marriage. So what if they are not the best noise cancelling headphones around – they definitely add to the style statement that most people buy these for. 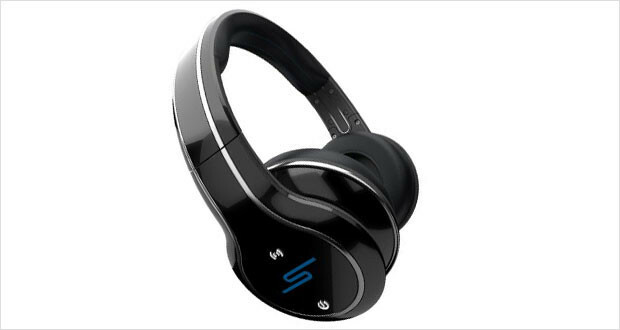 That is exactly the case with SMS Audio’s SYNC Wireless headphones made in conjunction with rapper 50 Cent’s endorsement. These huge wireless/wired hybrid headphones started off with a staggering $400 price tag that has since reduced substantially. These were poised to become the wireless world’s best over ear headphones – but the sound quality is not what you would want to associate with the best wireless headphones in the world. The highs and mids are mildly tinny and lack the punch of the overpowered bass of these headphones. The noise cancellation is non-existent and in fact the design allows more sound to leak into the headphones. However, for the current asking price these are quite useful headphones if you do not like mucking around with wires. The SYNC Wireless headphones are humongous behemoths – they easily eclipse most of your head and look more like helmets rather than headphones (okay we are exaggerating there). The entire thing is made of hard plastic that looks and feels like it can take quite a bit of a beating. The design elements are a nod to the other celebrity endorsed over ear cans such as Beats Studio by Dr. Dre and Signeo’s Soul by Ludacris. While it is not a foldable pair of headphones it does end up being extraordinarily tough. The hard plastic covering the headphones are very well made and are built to last. The headphones are a tad bit on the “oversized and overweight” end of the segment and thus people with smaller heads may not find these to be the most comfortable pair of cans around. Closed back headphones such as these usually do not have tinny highs, but some songs without equalizers sounded a little thin and flaky whenever high pitch guitars or synths played. The same sort of complaint remains for the midrange frequency response as well. These are by no means the most evocative and neutral sounding headphones. As expected, the bass is thumping, loud and incredibly rich. The depth makes up for the highs if you like the kind of music 50 cent makes! The noise reduction is abysmal – in some cases the huge cans tunnelled external sounds into the ear and muddled with the sound. The performance is quite adequate, considering that the audio fidelity is more or less preserved despite it being a wireless pair of headphones. The SYNC Wireless headphones from 50 cent’s designer brain may not be the best bang for the buck when it comes to audio quality, but if you like your music minus the clutter of wires all around you, you would be hard pressed to find something better at this price point.